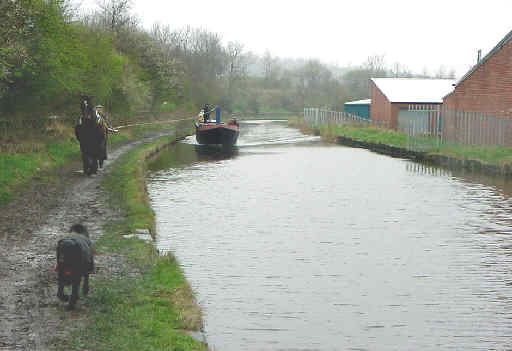 Bonny the Boat Horse towing the working boat Olive through Stalybridge. These pictures taken on April 10th 2001. A quick visit to the supermarket for a few provisions. 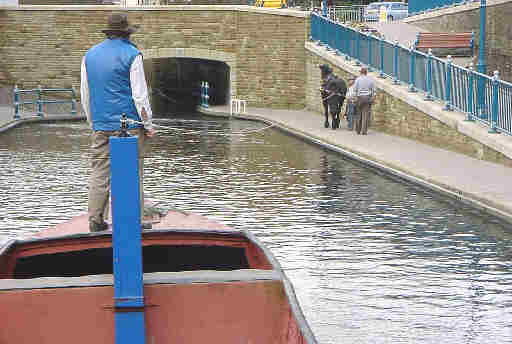 With no engine, the rope is needed to stop the boat while Lock 7W ahead is emptied. 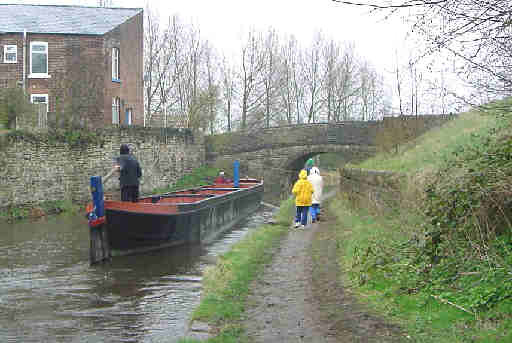 Heading under Mottram Road Bridge, with Lock 7W beyond. Lock 7W. It's a good job they cut the recess to add a lock ladder. This picture shows the walls of the lock being partly the original stonework and partly concrete. 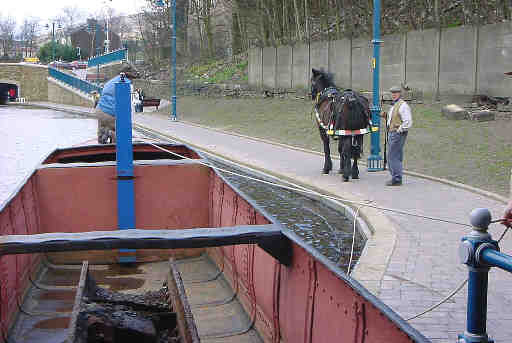 From Stalybridge, Bonny the Boat Horse towed the working boat Olive through Scout Tunnel to Mossley. These pictures taken on April 17th 2001. Olive manoeuvers into the bridge hole of North End Bridge, Stalybridge. The weather deteriorates as Bonny heads towards Grove Road, Millbrook. Passing below the huge pylon that was errected after the canal originally closed. 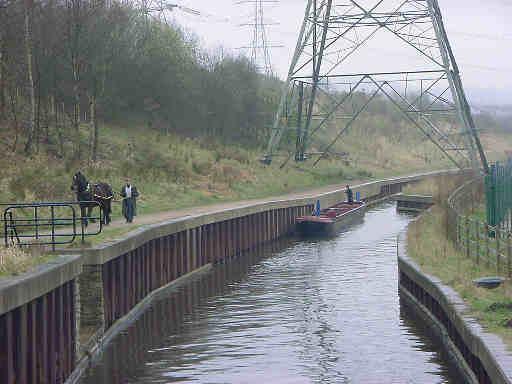 The narrow restored channel passes between the pylon's legs. Approaching Lock 8W. 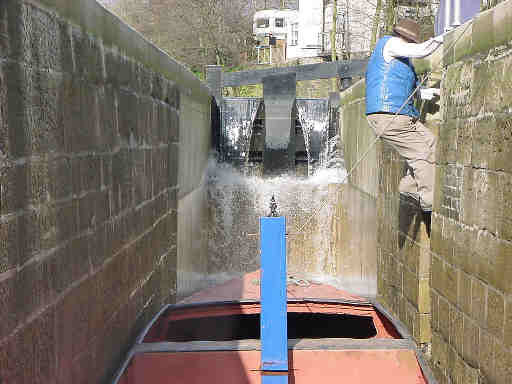 Click here to see pictures of the restoration work on the Huddersfield Narrow Canal. 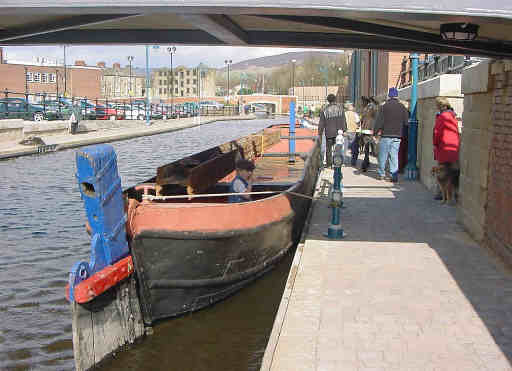 Click here to take a Virtual Trip along the whole Huddersfield Narrow Canal.